An interesting paper describing the absorption (25oC) and desorption (85oC) of CO2 from the atmosphere using a single column of solid fumed silica impregnated with polyethylenimine (PEI)—a life sustaining process familiar to all modern submariners1. 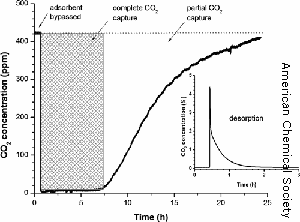 Contrast the above research paper with the recently published Economic and Energetic Analysis of Capturing CO2 from Ambient Air (pdf) and Prototype Demonstration of the Advanced CO2 Removal and Reduction System (pdf). 1. The Mark IIIB Scrubber (12 lbs CO2/hour) is expected to be replaced by the Advanced Carbon Dioxide Removal Unit (20 lbs CO2/hour) using the Solid Amine Carbon Dioxide Sorbant, manufactured under exclusive licence, by Steward Advanced Materials, beginning with Block IV (SSN 792-803) Virginia-class submarines. UPDATED 01/22/2012 Application of submarine CO2 scrubbing technology to remediate anthropogenic CO2 from our global ecosystem will be challenging given the: magnitude of the numbers; nascent understanding of our complex ecosystem and feedback mechanisms; and immature state of the technology.